Description :A state two (without date) of the second plate of this influential, and famous World map, issued in the first regularly produced world atlas. 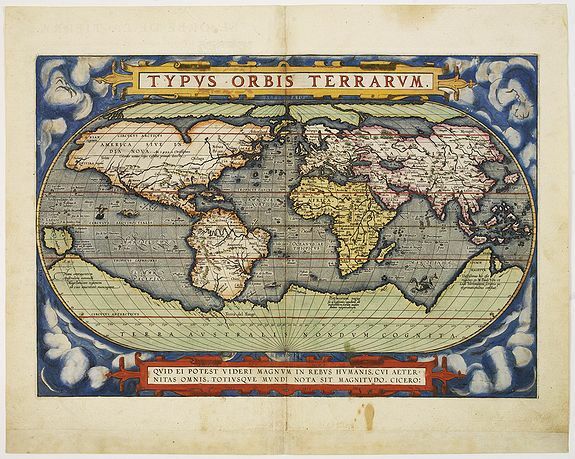 The map is a careful reduction of Mercator's landmark wall-map of the world. South America retains the unusual bulged south-west coast drawn by Mercator. There is also a prudent comment adjacent to New Guinea querying whether this large island is part of the southern continent or not. The plate has been signed by his engraver, Frans Hogenberg. According Marcel van den Broecke, the plate was introduced first with an engraved date of 1586 in 1587, but at the end of the year the date was removed. This second plate is far most the rarest, and he estimates that only 300 copies of this Spanish text edition have been printed. The Spanish text edition is the imitative of Christoffel Plantin himself. After a short stay in Calvinistic Leiden it was necessary for him to prove his loyalty to the Spanish king, so he decided to publish a Spanish translation of the "Theatrum", dedicated to the future King Philip III. Condition : Mint. With a 19th century binders slip. Some marginal discolouration.From the rare Spanish text edition of 1588.